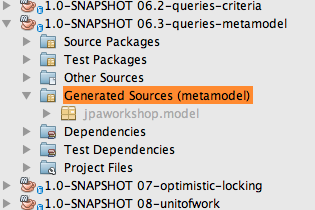 Some time ago I claimed that the JPA 2.0 metamodel API has the potential to revolutionize Java development. I still think that the concept is very interesting by showing an approach to strongly typed meta programming in Java. However I think it does not have any relevance in real world projects. One reason is that strongly typed JPA criteria queries are very verbose and bring their own accidental complexity compared with JPQL. The other reason is the actual usage of an annotation processor in any build environment is still too complicated. 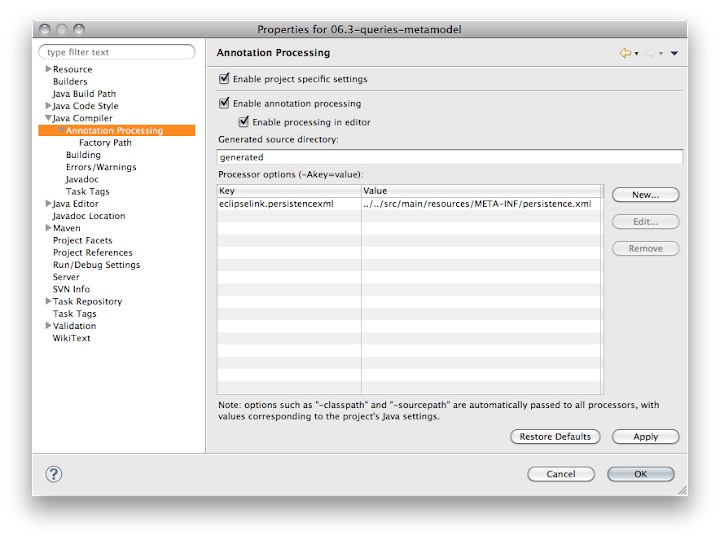 In the following I show how to configure the JPA metamodel annotation processor of EclipseLink for different environments. A working example for this is exercise 6.3 in our jpaworkshop. EclipseLink documentation is (once again) lacking, ignoring the reality that Maven is currently the most prominent build environment in the enterprise. Fortunately this is well documented here and here. 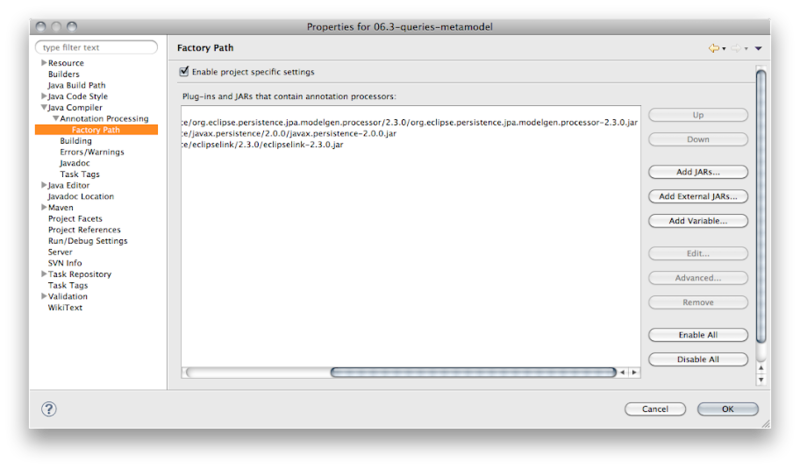 There are different maven processor plugins. 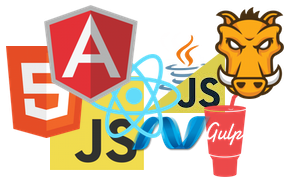 I am using maven-annotation-plugin, an alternative is the Apt Maven Plugin. In combination with IDEA the EclipseLink annotation processor detects the default META-INF/persistence.xml automatically without explicit configuration. You need to know the exact full qualified name of the annotation processor class. Generation of JPA metadata API classes works only on compilation (or on explicitly triggering annotation processing). It does not work on the fly when editing files, since IDEA does not have real background compilation. This approach is bad from the beginning, since those jars might change their name when you update them and they might not versioned together with your sources (this is the case when using Maven) . 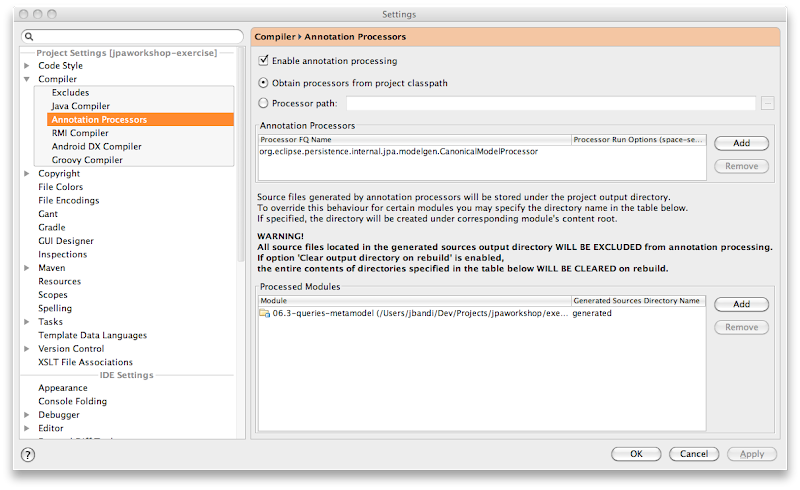 The approach of IDEA of locating annotation processors in the classpath by their class name is much better in this regard. Finally generation of JPA metadata API classes is also working in Eclipse. With the great background compilation of Eclipse it is nicely working on the fly when editing files. Maven plugin for metamodel generation with eclipselink? I've just included this dependency org.eclipse.persistence:org.eclipse.persistence.jpa.modelgen and metamodel generation work in maven and netbeans. Great Blog. Just few things to add in for the completion of the Blog. You need to add the below mentioned dependencies. It would be great if you add those in the blog as well.